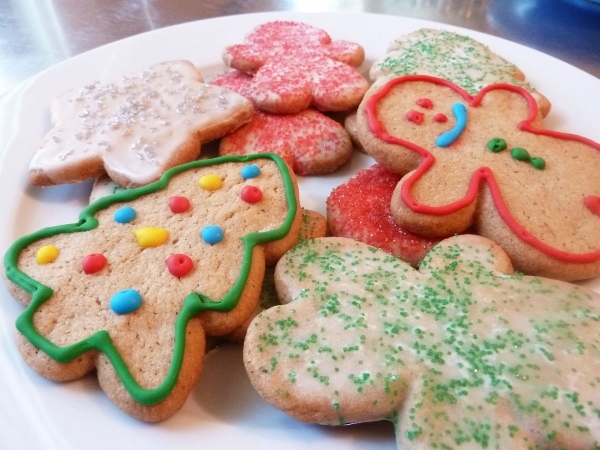 If you are tired of the regular Christmas cookies and sweets you always lay on the table on your colorful red and green table cloth year after year, this recipe for spice sugar cookies is just the thing you need to blow the minds of both kids and adults. Get ready for some amazing cinnamon and nutmeg flavors you have never tired before – the recipe is simple and is prone to become your all-time favorite from now on. Use a medium sized bowl to mix flour with baking soda and salt, add nutmeg and cinnamon and set is aside. Next, use a large bowl to beat the butter with the granulated sugar using a mixer (medium speed) and obtain a light and fluffy consistence. Add the vanilla and the egg and continue to mix. At low speed, beat in flour mixture and out the obtained dough in the refrigerator for at least a couple of hours- over the night, if possible. For the next steps of the process, preheat the oven to 375°F and start rolling out the dough until you get a thickness of 1/8 inches. Cut the dough into the desired holiday shapes of trees and Santa’s reindeers and place the pieces on greased baking sheet, baking for 8 minutes until they become lightly brown. If you are interested in getting some more easy recipes and watch detailed, explanatory videos for every new cookies’ idea you might want to try, use the videoculianry.com site at its Cookies category. Discover recipes for Bruti Ma Buoni cookies, Italian cookies that do not look their finest, but they taste incredibly good, or learn how to make some oyster and pearl cakes to know off the socks of all of your guests. Mix all of the ingredients together except for the food colors and add milk to bring the icing to the desired thinness. Use small shallow bowls to put the icing in and hold the cookies by their edges and dip the top of the cookies into the icing.